The United Nations and World Bank has unveiled their plans to make sure that everyone in the world has access to modern and sustainable electricity by 2030. The universal energy plan, which requires hundreds of billions in investments, has the aim to double both energy efficiency and renewable energy globally by 2030. But the UN and World Banks shuns nuclear energy in their vision. Around 1.3 billion people lack electricity in their homes or businesses. And nearly 40% of the world’s population have to rely on wood, coal or charcoal to cook their food with – which causes both environmental destruction and toxic gases that kills nearly two million people every year. Electricity could help children study after dark. It would allow medicines and food to be refrigerated. Electricity would also help replace outdated cookstoves and open fires, that are dangerous to people’s health, and many other things that we in the industrialized world take for granted. Access to electricity could make all the difference for the people who are without it today – but it needs to be modern and sustainable energy. Both the UN and World Bank sees the positive benefits of sustainable electricity. For the latter, electricity sparks social and economic development which creates improved lives and economic progress. 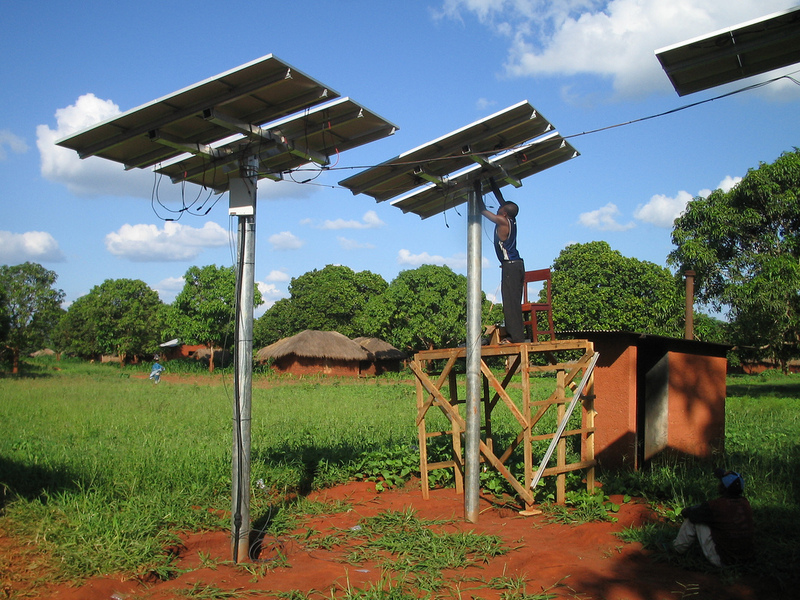 The UN believes access to clean and modern energy is key to achieve the Millennium Development Goals. The two international organizations therefore recently appealed to governments, international agencies and the private sector for money to help finance their universal energy plan. “Energy is the golden thread that connects economic growth, increased social equity, and an environment that allows the world to thrive,” UN Secretary-General Ban Ki-moon said during a press conference. It has been estimated that around $600-$800 billion a year till 2030 is needed to reach the campaigns target of universal access to electricity. The money will go towards efforts to double energy efficiency, with a special focus in the world’s highest-energy consuming countries, and doubling the world’s share of renewable energy by 2030. But not all energy sources are welcomed. “We don't do nuclear energy,” said Kim while he and UN Secretary-General unveiled their universal energy plans at a press conference this past November. Instead, the World Bank and UN wants to increase investments in renewable energy sources such as wind and solar power. "Nuclear power from country to country is an extremely political issue," Kim told reporters. "The World Bank Group does not engage in providing support for nuclear power. We think that this is an extremely difficult conversation that every country is continuing to have. And because we are really not in that business our focus is on finding ways of working in hydro electric power in geo-thermal, in solar, in wind," he said. "We are really focusing on increasing investment in those modalities and we don't do nuclear energy." This is not surprising. Nuclear is a highly controversial energy source, and the UN and the World Bank are wise to refrain from supporting it. While some environmentalists, such as Mark Lynas and George Monbiot, has called for increased investments in nuclear energy, many others, such as Al Gore, has said that nuclear is not the answer to our energy and climate crisis. It’s also hard to ignore the high costs and dangers involved in nuclear energy. Brazil, Norway, the Bank of America and OPEC has committed to support renewable energy and energy efficiency activities. Energy assessments have been launched in 42 countries with the first reports scheduled to be finished in April.